I can’t thank you enough for the warm and friendly manner that I was shown. The experience was a real treat. Each crew that showed up never failed to amaze me with the quality of work they were able to turn out in such a short time. These guys worked in some very unpleasant weather but never let it show. I would never consider recommending anyone else except Blue Haven. They kept their word and exceeded my expectations! For a fun, fuss-free family vacation, look no further than outside your back door. Take advantage of an attractive, easy-to-own aquatic oasis right at home. Blue Haven Pools can make it possible with affordable inground pool designs, professional construction, and automated, high-tech features. Throughout southern Alabama, our pool construction team builds custom pools & spas for nearly any kind of backyard, style preferences, project budget, and family needs. You can have a custom pool design like a curvy, organic shape in a tropical setting, a sleek, geometric infinity pool, or most anything in between. 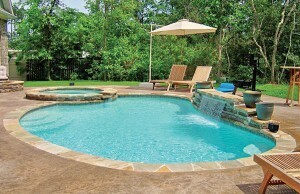 We offer a range of gunite pool designs and features. Examples include tanning ledges, in-floor mosaics, flagstone perimeter coping, and integrated landscape boxes. Your choices of decorative water features cross the spectrum—spouting statues, sheet-like cascades, rock grotto waterfalls, elevated spill-over spas, overflowing vanishing edges, spraying deck jets, and much, much more! Along with a new swimming pool in any size, shape, and configuration, we can provide decking, retaining walls, screen-room enclosures, and full build-outs of exterior space. Amenities include fire pits, walkways, pergolas, putting greens, lattice patio covers, and other additions for enhancing outdoor living space. Our business record speaks for itself: We have been the #1-ranked pool builder in South Alabama since 2005 (based on permitted pools built in Mobile and Baldwin counties). Our dedicated team has constructed more than 2,000 pools for residents throughout the Gulf Coast. 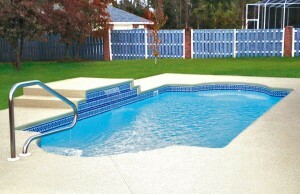 Our local company owner is a licensed pool contractor in Alabama (as well as Florida and Mississippi). He is also a licensed, certified pool operator, and he serves on the board of directors of the pool industry’s National Plasterers Council. Blue Haven Pools Mobile is a member of the national Association of Pool Spa Professionals, the Mobile Area Chamber of Commerce, and the Home Builders Association of Metropolitan Mobile. As a family-owned business, we take enormous pride in our work and always strive for 100-percent client satisfaction. Evidence of our commitment is illustrated by our consistent A+ rating with the BBB of Central and South Alabama. In fact, our construction manager has served on the Mobile board of directors. Be sure to also check out our Blue Haven Pools on the Gulf Facebook page and the numerous reviews and a current 4.8 average star rating from our many, many happy clients. As a pool builder, new projects remain our focus. 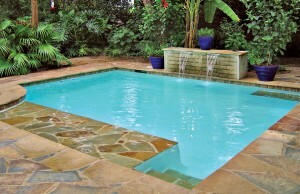 However, members of our team also offer weekly pool service, and we remodel pools that need some TLC as well. Ask for a VGB main drain retrofit on a public pool, replace a liner on a vinyl pool, or convert your inground pool from harsh chlorine to gentler saltwater systems or UV/ozone purification. Ready to build an amazing getaway—right in your backyard? Free in-home pool estimates are available to help you evaluate options for your new inground pool and backyard plans. You can also request a computerized virtual reality rendering of Blue Haven’s design concept for transforming your outdoor space. Feel free to visit our pool design center as well. It’s been open in the same location for 16 years, and you can come check out Blue Haven’s private line of SmartFeatures—advanced equipment for a pool that delivers maximum pleasure with minimum effort and expense. Pool financing programs are also available, and Blue Haven has helped thousands of swimming pool buyers obtain loans for their backyard dreams. So we’re here to help you get started today on your beautiful new pool & spa!